In this server there are no shop exclusive items, you literally can obtain everything ingame, so by definition it's under no circumstances a pay to win, you can pay to save yourself a lot of time, yes, but eventually people working hard without donating a cent will be able to catch up. Wait, you can actually obtain shadow tokens without donating? Or do you mean that by "no shop exclusive items" you have to be at the mercy of someone who donated and is willing to trade it with you? You can also obtain all the mounts and addons which are featured in the shop? You guys should ignore him and still working on this OT, I think its a great server, @Ashtar is a really talented guy and he has a really good team, keep it up guys, I liked the server. The definition of pay-to-win is when there is something that is purchasable for real-life money that is not obtainable ingame, that increases your character's strength significantly. This does NOT exist on Shadowrealm. There is no item in the donation store which you cannot obtain ingame simply by playing. Golden boxes? Every single item obtained from them is obtainable ingame. Templar set? There is a set with the exact same stats under a different name, which is easily obtained ingame. And I mean EASILY. Arena passes? Obtainable in the shadow coin shop for a very reasonable price. Dungeon passes? Same as the above. However, like I've stated before, it obviously gives you a significant boost in the beginning, by paying real money and supporting the server. Bump - deffo worth trying this server out! This looks cool and I would like to try it out, unfortunately it just crashes on launch. I will send you a pm with some information. Yep server only getting better also. So much stuff to do, even if u play 5-10hrs a day u always got dungeons,arenas or events to do to keep u busy and progress your character. And dungeons are super good for f2p players, drops both stats and spell stones and upgrade stones aswell, get your dungeons done everyday, and use ur spare rsc to get more dungeon charges and u will be flying up in power in no time. BUMP - WORLD BOSS EVENT! Btw, who are you on the server? You are probably a level 100 crying, you know nothing bro. So funny, you create an account just to flame, 30 players sure thats why yesterday there was over 40 players on a raid and plenty on a battlefield, several others questing, doing arenas and dungeons or even afk hunting or not. In fact in the moment of posting this there are 103 active players and 41 idle players (afk), the only reason or our numbers not being as high as before is because some time ago we decided to no longer reward mcs for being online. Also you are probably one of those persons who spects their vocation to be the most tank, damage dealer and epic sustain, all the vocations have their own identity. I will just assume you are a toxic hater. P2W: #3 player is free player, just puts his time into server. Zero Balance: No class can 1v1 anyone.....sounds like pretty good balance. Admins listen to donors: Sure they listen to donor thats what keeps server running, but they also balance around free players aswell. There are alot of strong free players, many who are in top 20 because they understand how to get ahead by using there brains....u are not one of them i can tell. Bugs: Every server has bugs everyday, most of ours are small and dont effect many people. And i prefer there to be bugs reported and fixed daily then on some servers where people abuse them for weeks/months without reporting. I can't run the client. Application crashed, anyone knows how to fix thix? Disappointed in the direction this server has gone in since reset. A council chat (Not 'Coincil' ash! Although funny that you said that) was formed for the constructive discussion of ideas to bounce around between active and decent players who wanted to make the server succeed. Instead, it seems to be ruled by one voice as of late and no discussion happens anymore. I feel as if the wrong players have been consulted with for the growth of the server and instead it has ended up hindering new players and rewarding the specific group who are involved in those very consultations. As much as I enjoyed the server, I much preferred the previous version. The relaunch was like everything changed but wasn't tested, causing the same issues again and then systems change on almost a weekly to fortnightly basis. I enjoy this server less and less each day and I hope that Ash has the sense to stop and think about what is happening to a server with a huge amount of potential, before it is too late to do anything at all. I agree on the statement that is being point out. It had this grindy feeling before the reset. Now some people feel they should be where they were before reset in a couple of days. This in combination with the thoughtless ideas and implementations lately it has turned in something average and less and less unique everyday.. Sorry for the typo, there is a clear problematic and I see we're you're coming from and while I agree on some of your points I will have to disagree on others. First unfortunately the server community is pretty much selfish, most of the time the whole arguments in our chats are related to "why in god's name my vocation isn't the strongest? (not literally but you get the point), everyone complains and argues why their vocation should be better and why the other vocations should be nerfed, ignoring the fact that each vocation has it's own identity, as you may see, this is dissappointing, everyone getting heated up over pvp beef and personal interest, the problem comes when their beef gets so intense to the point that we're forced to implement changes to make them "more balanced", leading into the same circle again at some other point. 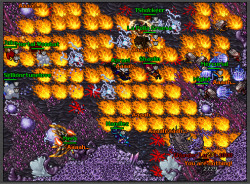 Second, @Weelet has mentioned the most important problem in the server now a days, and this is not just a problem in this server but in open tibia in general, when people is trying to compete on a server, they are viciously trying to devour content as fast as possible to be better or stronger than their enemies, if they don't progress as fast as they want they get angry and rage over chats and start convincing other folk that the issue is the server "stoping" their progress, once again back to the lazy and selfish mentallity of the open tibia community now a days, stopping them from doing so results in them quitting and making other quit, on the other hand making them happy and providing the progress speed they want results in death of a server since development can't keep up with a player's progress. Changes we have done recently are done to make most of the players happy while trying our best to make things fair for everyone wish the risk of course of not being able to keep up with the progress sooner or later, thing is, we as developers are creating content for our players, if the majority of our players think the same way, then, thats most likely the direction we have to go to keep our player base or increase it. 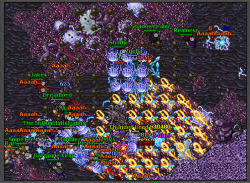 We are working hard each day on providing a better game experience and as much content as we can so people keeps busy with fun things to do, but sometimes when we introduce new systems like world boss raids, people finds ways to abuse it, ways that are out of our reach to control, like using vpns or asking their friends to join with other accounts to gain 2x rewards, skipping our anti MC measures. That sort of behavior just makes our life harder and also stops us from implementing new content as fast as we would like, anyway, we are working hard on finding a proper balancement on how fast a player can progress and what new content is gonna be available when players reach further points, even so it might seem we're listening to the wrong people, overall we still have a plan to make things great, have a little faith in us. The only real issue i saw with server was that every upgrade relied on only a few items vets,elites,champs. And some was nearly impossible to obtain. As of now, u can get demonic gear by doing quest not buy farming for 100's of hours to get elites to build a few items, so thats a huge weight off peoples shoulders. And now challenge bosses can also drop them so u can get exotic gear easier then before. Fact is, u will never succeed to the degree Ashtar wants to as a full grind server, u will only have free players on server, as most donors have jobs and cant stay online 16hrs a day thats required on a grind server. Yes, donor progress faster, but now alot more items are avaible to free players to, by donors being able to progress out of some gear, they are able to pass it down or sell it to free players who would normally take weeks or months to grind it out. Im still trying to buy shadow tokens without donating(dosnt work out when you are at the will of the donater). ~ 1 month later ~ I would LOVE the arrows but im not paying 120$ for 10%?15%? dmg. other than that, the server is good fun! And to say this isnt p2w is kind of a joke. No it IS a joke. Buys x10 solo boss passes If you want to charge so dang much for stuff like this, Im thinking you need more players.